The MotoGP™ FP2 outing saw Andrea Dovizioso top the timesheets at the Gran Premio TIM di San Marino e della Riviera di Rimini, with Yonny Hernandez and Dani Pedrosa just behind him on combined times. 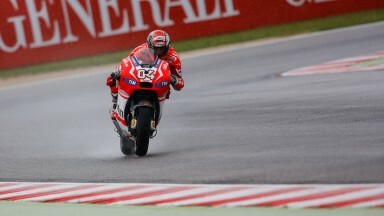 Dovizioso (Ducati Team) put in a best time of 1’49.195 in a rain affected FP2 to lead the way despite a crash early in the session. Hernandez (Energy T.I. Pramac Racing) produced a best time of 1’50.310 in the morning to lead FP1 and was second overall, but did not improve in the afternoon practice which he finished fifth. Pedrosa was second in FP2 and third best overall with a time of 1’50.356 on the Repsol Honda RC213V. 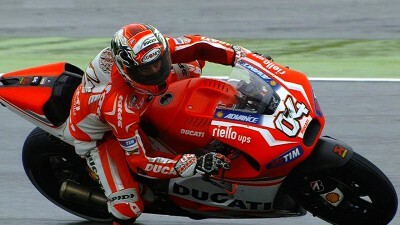 Marc Marquez (Repsol Honda Team) and Danilo Petrucci (IodaRacing Project) completed the overall top five. Pol Espargaro (Monster Yamaha Tech3), Stefan Bradl (LCR Honda MotoGP), Jorge Lorenzo (Movistar Yamaha MotoGP), Andrea Iannone (Pramac Racing) and Valentino Rossi (Movistar Yamaha MotoGP) were all in the top ten. Rossi was one of several crashers in the morning session but was not hurt in the accident. Iannone was another morning crasher and he took a heavy ankle blow but was able to continue riding after lunch. Aleix Espargaro (NGM Forward Racing), Iannone, Bradley Smith (Monster Yamaha Tech 3) and Karel Abraham (Cardion AB) all had FP2 falls too. Teammates Scott Redding and Alvaro Bautista (GO&FUN Honda Gresini) and Alex De Angelis (NGM Forward Racing) fell in the final minutes of practice but were fortunately unharmed. For full combined Friday practice times click here.